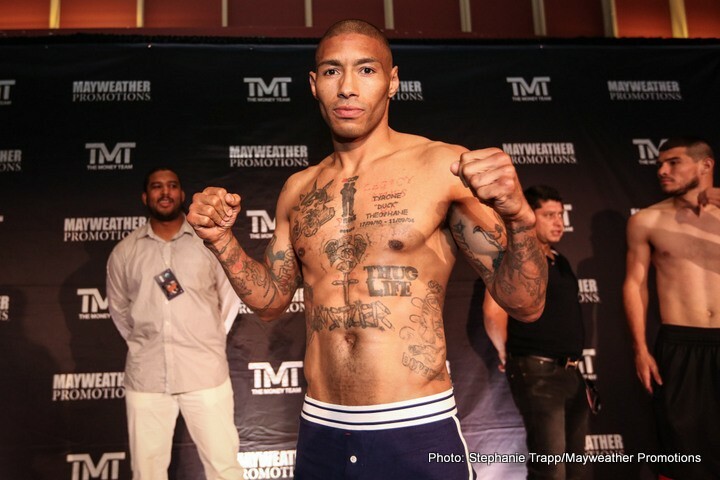 LAS VEGAS (March 18, 2016) – 140-pound contender Ashley “The Treasure” Theophane and super middleweight contender J’Leon Love hosted a Las Vegas media workout Thursday as they prepared for their respective showdowns on Friday, April 1 from the DC Armory in Washington, D.C.
Theophane takes on super lightweight world champion Adrien “The Problem” Broner in the main event of Premier Boxing Champions (PBC) on Spike beginning at 9 p.m. ET/8 p.m. CT. Love will compete in a non-televised undercard attraction. Tickets for the live event, which is promoted by About Billions Promotions and Mayweather Promotions in association with HeadBangers Promotions, are priced at $200, $100, $50 and $25, and are on sale now. To purchase tickets visitwww.ticketmaster.com, Ticketmaster locations or call (800) 745-3000. Theophane and Love held court at the Mayweather Boxing Club as they went discussed their upcoming showdowns with media. “The focus is to go in there and outwork him on fight night. At the end of the day I have to set the pace. I can’t go out there and outbox him because he’s got tremendous skill and speed. So I have to be able to go out there and outwork him and make it a war. “When he sees that I’m still there in round 5, he’s going to start to get worried. My whole thing on fight night is to work and bring a war. “As a boxer, you want to fight the best, and you want these big nights. For me, it’s been a hard road to get to this point, and I’m actually looking forward to fight night because I know it’s going to be a very hard fight, and I know in order for me to win I have to be at my best, and that’s what I have prepared for. “I’ve been sparring a lot of strong young men in camp; a lot of guys who many believe will be future stars of boxing, and I’ve been doing very well, so I’m more than ready. It’s just a matter of counting down the days now. “My career shows that if you believe in yourself and never give up, you will get your opportunity. At that point, it’s just up to you to take it. “I feel I will be able to match him come fight night. I know I’m the big underdog, I know I’m not being given the chance to win, but I really believe we are going to prove the doubters wrong and be world champ come April 1. “It just became real to be in the same place with him [Broner] at the press conference. It was more motivation to come back in the gym. Once we got back, the guys here at the gym saw me sparring the next day and said they can tell he had motivated me. He can talk, but on fight night, we have to fight. He said he’s going to stop me in 4 rounds, so I’ll be looking forward to seeing that because I’m not going anywhere. I’m going to be there for the whole 12 rounds. “Training has been great; I’m healthy, I’m focused, my weight is not bad, I can’t complain. I actually took a week off in September of last year, and have been right back in the gym. We’ve been training ever since for 5 or 6 months now, so we were already ahead. “This guy [Gbenga], despite his record, has been in the ring more times than me, so he is a lot more experienced. He can survive, or do little things that can upset my game plan, but at the same time, I’ve been there done that, and just ready to showcase my talent. “Every fight is important, whether it’s the first couple of fights, or now. To me, this is a stay busy fight-stay busy, showcase my talent, look impressive, and show that we’re ready for a world title. Not just fight for a world title, but win a world title. Be a world champion. Continue to reach different levels in the game. “I’m hungry, I feel like this is already written for me. I didn’t make it this far for nothing, or to be a contender. For a world championship fight, I’m going to definitely seize the moment so I’m going to go out there and do what I do best, and that is to fight.